Model UN is a simulation United Nations conference. High School students from all over the world gather for a 3 to 4 day conference to simulate either debates currently taking place in the United Nations, or historic events that shaped international policy. 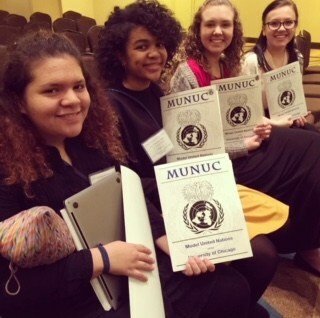 This year, Christian Life will attend three of these conferences; MUNUC (Model United Nations of the University of Chicago), MUNI (Model United Nations of the University of Illinois), and RockMUN (Rock Valley College United Nations). The conferences are a chance for Christian Life students to put their critical thinking skills to the test and work collaboratively with other students to create solutions to global issues.